Careers Cost > How Much Do Meeting Rooms Cost? 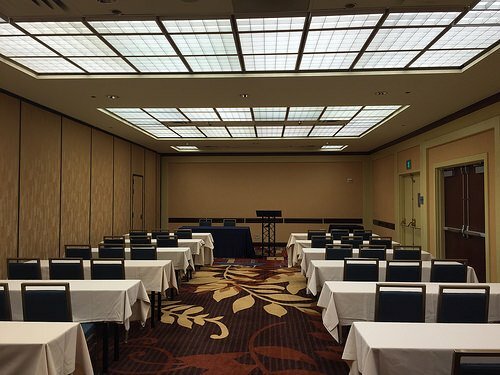 Meeting rooms are often considered rooms where meetings or training sessions are usually held, commonly found in hotel chains across the United States. They are usually rented by companies if there is no space available to hold these events in their private office or they need to meet in a particular location. Meeting rooms will often provide a well-furnished meeting space that includes tables, chairs, a screen and other amenities to make the meeting as successful as possible. The price for meeting rooms depends on several factors such as the size of the room, the equipment included in the room, the venue/hotel you’re using and the geographical location of the meeting room. On average, the price to rent a meeting room can be as little as $20 to as much as $500 per hour. Most companies are going to spend anywhere from $20 to $75 per hour. Cubicles that fit 1 to 3 people can cost $10 to $20 per hour, while conference rooms that fit up to six to eight people can cost upwards of $18 to $35 per hour. Larger rooms that accommodate 10 to 15 people can cost $40 to $60 per hour. Larger meeting rooms that hold more than 100 people can be close to the $150 to $300 price range. According to DavinciMeetingRooms.com, the price for meeting rooms ranges anywhere from $25 to $53 per hour depending on the location. Regus.com has meeting rooms located in various locations, and according to the website, they offer rooms ranging anywhere from $45 to $104 per hour. Meeting room rates, at a minimum, should include the basic accessories and materials needed to facilitate a meeting or conference. This will include the tables, chairs, a projection screen and sometimes the audio equipment and projector for a fee. Some companies will provide pens and papers while others will have a TV, internet connection as well as video conferencing. These meeting rooms can either be rented for half the day (four hours), a full day (around eight hours) or for 24 hours, referred to as a 24-hour hold. Depending on the hotel and venue, some may only have one dedicated room, while others may have various options. According to our research, most of your three-star hotel chain brands, such as the Hampton Inn and Holiday Inn, would have meeting rooms that range anywhere from 600 to 1,000 square feet, while the Doubletree and Hilton brands could accommodate larger groups, oftentimes offering rooms larger than 3,000 square feet. Internet, phone or fax access may be an additional fee depending on the company rules. Food and beverage may be served if a hotel has a restaurant on its premises. Taxes and miscellaneous fees may apply. Consider meeting in an area that does not require a payment up front. Places such as a library, park or even a restaurant can be more cost effective than a meeting room. Be creative when it comes to picking out a meeting space. As long as you don’t have more than five people, it shouldn’t be that hard to find a place that can accommodate you. SpeakernetNews.com has a few ideas to lower your meeting room costs. Don’t choose a room that had a lot of added commodities if these are not necessary because you will probably be paying more for this type of room. If holding a meeting at a restaurant, consider calling up ahead of time to have a room set up. Many can offer bulk menus to bring the costs down. Booking a hotel meeting room can often lead to discounted hotel rooms as well.